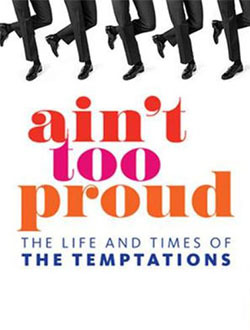 Ain’t Too Proud is an electrifying new musical about the life and times of The Temptations, “the greatest R&B group of all time” (Billboard Magazine). Five young guys on the streets of Detroit were discovered by Berry Gordy, who signed them to his legendary new label. With their signature dance moves and unmistakable harmonies, they rose to the top of the charts—creating an amazing 42 Top Ten Hits with 14 reaching number one. Through friendship and betrayal amid the civil unrest that tore America apart, their moving and personal story still resonates five decades later. Don't miss this electrifying new musical about “the greatest R&B group of all time." With their signature dance moves and harmonies, they rose to the top of the charts, and their moving story still resonates five decades later. The show features such iconic hits as “My Girl,” “Just My Imagination,” “Papa Was a Rolling Stone," and many more. Event Notice: Recommended for ages 12 and up. The performance contains some strong language not suitable for young children. This performance includes haze and smoke effects, a brief moment of flashing light, and a gunshot sound effect. Show Run Time: Approximately 2 hours, 30 minutes including one 15-minute intermission.